Scapholunate Interosseous Ligament (SLIL) injury accompanies intra-articular radius fractures in 5-64% [1-8]. It is an important stabilizer of the carpal motion between the scaphoid and lunate . Injury of the SLIL can lead to scapholunate dissociation (SLD) eventually leading to a scapholunate advanced collapse (SLAC) of the wrist in some cases [6, 10, 11]. These changes in wrist biomechanics can lead to carpal osteoarthritis along a predictive path [12-14]. It is therefore important to perform scapholunate ligament reconstruction before this cascade begins. However, it is unpredictable what patients will develop symptoms . In the acute posttraumatic radiographs of distal radius fractures, a scapholunate diastasis (>3mm) is often seen [8, 16, 17]. However, these are not always clinically relevant. Possibly, ligamentous healing takes place during the immobilization [4, 18, 19]. Nonetheless, some patients receive simultaneous open distal radius fixation and direct SLIL reconstruction [20-24]. Through our clinical experience, we believe that few of the patients with acute scapholunate diastasis actually develop symptoms. The aim of this study was to determine the incidence of SLD’s associated with distal radius fractures and to evaluate the functional outcomes of these patients. After ethics committee approval, we retrospectively evaluated all distal radius fractures (n=391) from 2007 to 2015 that were treated in the British Hospital of Montevideo, Uruguay. These were identified through an ongoing procedure database kept by the traumatology department, that collects patient and treatment data prospectively. Patients with a non-anatomic fracture position were operatively treated using a volar approach with volar variable angle plate. The scapholunate joint was not surgically treated in any patient. All patients underwent a postoperative Computer Tomography (CT) scan. We excluded one patient with a bilateral distal radius fracture that had a SLD of one of the fractured sides. Patients (n=14) with a scapholunate interval (SLI) of ≥3mm in the injured wrist underwent a CT scan of the contralateral wrist. Of these patients 8 (57%) had a contralateral SLI that was ≥3mm. We included 2 males and 4 females, with a median age of 61 (54-87) years with an average radiographic follow-up of 109±91 weeks and average functional follow-up of 136±90 weeks. One patient had a conventional radiograph at final follow-up, all other patients had a CT scan. There were 3 type C3 fractures, 1 type C1 fracture, 1 type B2 fracture and 1 type A2 fracture. There was an associated ulna fracture in 2 patients. Computer tomography scan (SOMATOM Emotion 16, Siemens Healthcare, Malvern, Pennsylvania, USA) images of the wrist were obtained directly postoperatively and at final radiographic follow-up. Measurements were performed using OsiriX Viewer (Pixmeo SARL, Bernex, Switzerland). The scapholunate interval was measured positioning the CT beam parallel to the SLI in the axial plane (Fig. 1). The CT slices were digitally increased to a width between 7-14mm to evaluate the SLI and the scapholunate angle (SLA) in the mean modus. We measured the SLI from the midpoint of the lunate to the midpoint of the scaphoid in the coronal plane. The SLA was evaluated in a sagittal plane by calculating the angle between the scaphoid axis and the lunate axis (Fig. 2). The functional outcome was evaluated using the Quick Disabilities of the Arm, Shoulder and Hand (qDASH) was used. Continuous data were stated as mean ± standard deviations and categorical data as frequencies and percentages. We used a linear regression to compare the differences between SLI distances and SLA in the postoperative CT scan compared to the CT scan at final follow-up. The average postoperative SLI was 4.1±0.4mm and the average SLI at final follow-up it was 4.3±0.9mm (p=0.64). The average postoperative SLA was 63.8±5.0° and at final follow-up this as 63.6±6.9° (p=0.33). Five patients had a Quick DASH score if 0 and one patient had a score of 18.2, this patient had severe preexisting degenerative osteoarthritis of the injured wrist. No patient required additional surgery of the SLIL. Fig. (2). Measurement of the scapholunate angle in the sagittal plane. In this study, we evaluated the scapholunate interval (SLI) in 391 patients with a distal radius fracture that underwent volar plate fixation. Using a computer tomography of the wrist we measured the SLI defining a scapholunate diastasis when the SLI was ≥3mm. Of all the distal radius fractures, there were 14 patients with a SLD, of which 8 showed a SLI of ≥3mm in the contralateral wrist. We identified 6 patients with unilateral SLD’s, possibly due to a SLIL tear. This highlights the importance of bilateral imaging as is the case in other uncommon traumatic conditions of the wrist [25-27]. None of the patients with an SLD had treatment of their scapholunate joint. After an average follow-up of more than 2 years months 5/6 patients reported an excellent DASH score. The patient with poor functional outcome had preexisting bilateral degenerative osteoarthritis of both wrists, experiencing more pain in the uninjured wrist (Tables 1 and 2). However, we need to interpret these results in respect to its strengths and limitations. First, we did not compare the outcomes of patients with an SLD to those without an SLD. Second, the measurements were performed by one author. Thirdly, CT scans are not standard clinical practice in all settings and our results are not applicable for conventional radiographs. 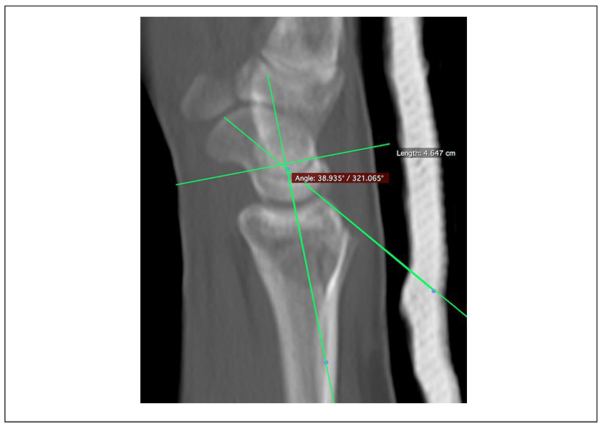 The advantage of using CT scans is that it allows the evaluator to precisely position the radiographic beam parallel to the scapholunate joint avoiding measurement errors due to angulated views of the wrist. Suzuki et al. reported a sensitivity of 75% and specificity of 90% using computer tomography scans to measure the SLI . The value of this study is that this is the first study using bilateral CT scans to compare the SLI after a distal radius fracture. Additionally, gives insight in the subjective outcomes of untreated SLD in patients with a distal radius. Table 1. Patient characteristics with unilateral scapholunate dissociation. Distal radius fractures are often accompanied with ligamentous injury, most frequently triangular fibrocartilage complex injuries followed by the SLIL injuries [1, 3, 5, 22, 29-35]. The scapholunate interosseous ligament is the most important stabilizer of the scapholunate joint and is the first to tear when axial loading of the wrist occurs [9, 36]. Mudgal and Jones emphasized to be aware for a SLIL injury in the presence of a fracture line between the scaphoid- and lunate fossa . Furthermore, Mudgal advised treatment of scapholunate diastases when present as part of a four-part distal radius fractures . Others have suggest scapholunate fixation for Geissler grade 3 and grade 4 SLIL tears [20-22]. It is however, still unknown what patients with SLIL injury develop scapholunate advanced collapse (SLAC) and what patients develop symptoms [6, 10]. In a study by Fassler et al. 73% of the patients with radiographic evidence for a SLAC did not report pain . The golden standard to diagnose scapholunate tears is by arthroscopy of the wrist . Using this modality, scapholunate tears associated with distal radius fractures occur in 7-64% patients [1-3, 5, 6, 20-22, 29, 32, 33, 35, 38-41]. The incidence of concomitant SLIL is lower in extra-articular fractures (7-33%) [2-4, 42]. Arthroscopically assisted distal radius fracture treatment allows confirmation of SLIL tears, but many of these lesion seem to be clinically irrelevant [1, 6]. Repeated arthroscopies to evaluate ligament healing would be ideal but are an unacceptable burden for patients and have therefore not been performed. In conventional anteroposterior radiographs SLD is often defined as a SLI of equal to or more than 2- or 3mm. Incidences reported using ≥2mm range 26-52% whereas studies using ≥3mm report incidences of 5-8%. After distal radius fracture reduction many SLD’s may resolve, possibly due to ligamentotaxis . Geissler et al. showed that Geissler grade 3 or 4 lesions had a radiographic SLI of ≥3mm . Therefore we chose ≥3mm to define a SLD as we considered this clinically relevant. Using the CT scan we found an incidence of SLD in 1.5% of the patients, which is lowest incidence reported to date. Furthermore, we found that 57% of the SLD’s were bilateral which is similar as in literature, where this has been reported to be present in 38-52% [10, 43]. We believe that using a radiographic cut-off for SLD of ≥2mm diagnoses many clinically irrelevant increased scapholunate intervals. Outcomes regarding SLD’s associated with distal radius fractures are contradicting. Several reports with a follow-up of 1-year have shown no differences between patients with or without SLD accompanying a distal radius fracture [1, 29, 42]. On the contrary Tang et al. showed significantly increased SLI’s after one year follow-up in 20 patients treated with cast immobilization and that 8 patients had symptoms requiring SLIL treatment after one year . They suggested that a SLI of ≥3mm along with the presence of additional signs of carpal instability such as the cortical ring sign, a scapholunate angle >70° and foreshortening of the scaphoid are indicative for severe injury. In our eyes defining the precise origin of wrist pain in a posttraumatic wrist is difficult, especially attributing pain to the scapholunate joint. Further support for worse outcomes in patients SLIL tears has been reported by Kasapinova et al. but in this study the follow-up was only 6 months and it compared inhomogeneous treatment groups . This makes it difficult to generalize their outcomes. In a series of 15 patients with type B fractures Yoshida et al. arthroscopically confirmed SL tears 14 patients and suggested that pinning Geissler grade 3 and 4 leads to better outcomes at a mean follow-up of 11.8 months . It is however difficult to change practice based on these results because three patients that were pinned were compared to three that were not pinned, without any statistical analysis. With regard to long-term follow up, the outcomes are in favor of conservative treatment of SLD’s associated with distal radius fractures. Mrkonjic et al. evaluated arthroscopically diagnosed scapholunate tears after 13-15 years of follow up after conservative treatment . They concluded there was no difference in objective or subjective outcomes in patients with Geissler grade 3 tears compared to grade 1-, grade 2- or no tears. These findings were confirmed by Finsen et al. that defined SLD as a SLI ≥2mm in conventional radiographs of extra-articular distal radius fractures and evaluated the outcomes of 12 patients after a mean follow-up of 6 years . They concluded that the outcomes with or without SLD were similar, although statistical analysis was lacking. Added to that, scapholunate fixation along with distal radius fixation does not seem to improve functional outcomes at 4 years follow up . In conclusion, we have highlighted the importance of bilateral wrist imaging as 57% of the wrists showed bilateral scapholunate intervals of ≥3mm. Furthermore, we showed that patients with distal radius fractures that underwent surgical volar plate fixation and no treatment of the scapholunate interosseous ligament had excellent patient reported outcomes. Distal radius fractures are not associated with a high incidence of clinically significant SLI and when one is detected the opposite wrist is likely to show a similar finding. Therefore, initial treatment of a SLI of ≥3mm does not always require treatment when accompanying a distal radius fracture. Further studies addressing long term functional outcomes are needed to increase our understanding of the consequences of scapholunate interosseous ligament injuries. Approved by Ethical Commission (Comité de Etica y Calidad Acta) Hospital Britanico, Montevideo, Uruguay. JL, AL, NCC and JBJ give their consent for publication of this original article. JL certifies that he has no commercial associations (eg, consultancies, stock ownership, equity interest, patent/licensing arrangements, etc) or financial remunerations that might pose a conflict of interest in connection with the submitted article. AL certifies that he has no commercial associations (eg, consultancies, stock ownership, equity interest, patent/licensing arrangements, etc) or financial remunerations that might pose a conflict of interest in connection with the submitted article. NC certifies that he has no commercial associations (eg, consultancies, stock ownership, equity interest, patent/licensing arrangements, etc) or financial remunerations that might pose a conflict of interest in connection with the submitted article. JBJ certifies that he has no commercial associations (eg, consultancies, stock ownership, equity interest, patent/licensing arrangements, etc) or financial remunerations that might pose a conflict of interest in connection with the submitted article. Forward DP, Lindau TR, Melsom DS. Intercarpal ligament injuries associated with fractures of the distal part of the radius. J Bone Joint Surg Am 2007; 89(11): 2334-40. Geissler WB. Arthroscopically assisted reduction of intra-articular fractures of the distal radius. Hand Clin 1995; 11(1): 19-29. Richards RS, Bennett JD, Roth JH, Milne K Jr. Arthroscopic diagnosis of intra-articular soft tissue injuries associated with distal radial fractures. J Hand Surg Am 1997; 22(5): 772-6. Gunal I, Ozaksoy D, Altay T, Satoglu IS, Kazimoglu C, Sener M. Scapholunate dissociation associated with distal radius fractures. Eur J Orthop Surg Traumatol 2013; 23(8): 877-81. Lindau T, Arner M, Hagberg L. Intraarticular lesions in distal fractures of the radius in young adults. A descriptive arthroscopic study in 50 patients. J Hand Surg [Br] 1997; 22(5): 638-43. Mrkonjic A, Lindau T, Geijer M, Tägil M. Arthroscopically diagnosed scapholunate ligament injuries associated with distal radial fractures: A 13- to 15-year follow-up. J Hand Surg Am 2015; 40(6): 1077-82. Lee JS, Gaalla A, Shaw RL, et al. Signs of acute carpal instability associated with distal radial fracture. Emerg Radiol 1995; 2: 77-83. Rosenthal DI, Schwartz M, Phillips WC, Jupiter J. Fracture of the radius with instability of the wrist. AJR Am J Roentgenol 1983; 141(1): 113-6. Short WH, Werner FW, Green JK, Masaoka S. Biomechanical evaluation of the ligamentous stabilizers of the scaphoid and lunate: Part II. J Hand Surg Am 2005; 30(1): 24-34. Akahane M, Ono H, Nakamura T, Kawamura K, Takakura Y. Static scapholunate dissociation diagnosed by scapholunate gap view in wrists with or without distal radius fractures. Hand Surg 2002; 7(2): 191-5. Fassler PR, Stern PJ, Kiefhaber TR. Asymptomatic SLAC wrist: Does it exist? J Hand Surg Am 1993; 18(4): 682-6. Watson HK, Ryu J. Evolution of arthritis of the wrist. Clin Orthop Relat Res 1986; (202): 57-67. Tischler BT, Diaz LE, Murakami AM, et al. Scapholunate advanced collapse: A pictorial review. Insights Imaging 2014; 5(4): 407-17. Kitay A, Wolfe SW. Scapholunate instability: Current concepts in diagnosis and management. J Hand Surg Am 2012; 37(10): 2175-96. O’Meeghan C, Stuart W, Mamo V, et al. The Natural history of an untreated isolated scapholunate interosseous ligament injury. J Hand Surg Eur Vol 2003; 28–B: 307-10. Jones VM, Everding NG, Desmarais JM, Soong MC. Scapholunate instability after distal radius volar plating. Hand (NY) 2015; 10(4): 678-82. Tang JB, Shi D, Gu YQ, Zhang QG. Can cast immobilization successfully treat scapholunate dissociation associated with distal radius fractures? J Hand Surg Am 1996; 21(4): 583-90. Bunker DL, Pappas G, Moradi P, Dowd MB. Radiographic signs of static carpal instability with distal end radius fractures: Is current treatment adequate? Hand Surg 2012; 17(3): 325-30. Desai MJ, Kamal RN, Richard MJ. Management of intercarpal ligament injuries associated with distal radius fractures. Hand Clin 2015; 31(3): 409-16. Peicha G, Seibert F, Fellinger M, Grechenig W. Midterm results of arthroscopic treatment of scapholunate ligament lesions associated with intra-articular distal radius fractures. Knee Surg Sports Traumatol Arthrosc 1999; 7(5): 327-33. Kasapinova K, Kamiloski V. Influence of associated lesions of the intrinsic ligaments on distal radius fractures outcome. Arch Orthop Trauma Surg 2015; 135(6): 831-8. Ogawa T, Tanaka T, Yanai T, Kumagai H, Ochiai N. Analysis of soft tissue injuries associated with distal radius fractures. BMC Sports Sci Med Rehabil 2013; 5(1): 19. Mudgal CS, Jones WA. Scapho-lunate diastasis: A component of fractures of the distal radius. J Hand Surg [Br] 1990; 15(4): 503-5. Mudgal C, Hastings H. Scapho-lunate diastasis in fractures of the distal radius. Pathomechanics and treatment options. J Hand Surg [Br] 1993; 18(6): 725-9. Schmidt I. Case Report Posttraumatic ulnar carpal translocation type I accompanied with disruption of the lunotriquetral ligament caused by a severe radiocarpal fracture-dislocation injury type II accompanied with complete luxation of the distal radioulnar joint. W. Trauma Emerg Care 2017; 2: 1-5. Schmidt I. Does total wrist arthroplasty for treatment of posttraumatic wrist joint osteoarthritis in young patients always lead to restriction of high-demand activities of daily living? Case report and brief review of recent literature. Open Orthop J 2017; 11: 439-46. Suzuki D, Ono H, Furuta K, et al. Comparison of scapholunate distance measurements on plain radiography and computed tomography for the diagnosis of scapholunate instability associated with distal radius fracture. J Orthop Sci 2014; 19(3): 465-70. Swart E, Tang P. The effect of ligament injuries on outcomes of operatively treated distal radius fractures. Am J Orthop 2017; 46(1): E41-6. Gologan R, Ginter VM, Haeffner A, Obertacke U, Schreiner U. 1-Year outcome of concomitant intracarpal lesions in patients with dislocated distal radial fractures: A systematic assessment of 78 distal radial fractures. Arch Orthop Trauma Surg 2016; 136(3): 425-32. Klempka A, Wagner M, Fodor S, Prommersberger KJ, Uder M, Schmitt R. Injuries of the scapholunate and lunotriquetral ligaments as well as the TFCC in intra-articular distal radius fractures. Prevalence assessed with MDCT arthrography. Eur Radiol 2016; 26(3): 722-32. Varitimidis SE, Basdekis GK, Dailiana ZH, Hantes ME, Bargiotas K, Malizos K. Treatment of intra-articular fractures of the distal radius: Fluoroscopic or arthroscopic reduction? J Bone Joint Surg Br 2008; 90(6): 778-85. Ruch DS, Patel P, Papapetropoulos P, et al. The influence of anatomic reduction on outcomes at one-year following intra-articular distal radius fractures. J Hand Surg Am 2010; 35: 25-6. Lee SK, Model Z, Desai H, Hsu P, Paksima N, Dhaliwal G. Association of lesions of the scapholunate interval with arthroscopic grading of scapholunate instability via the geissler classification. J Hand Surg Am 2015; 40(6): 1083-7. Geissler WB, Freeland AE, Savoie FH, McIntyre LW, Whipple TL. Intracarpal soft-tissue lesions associated with an intra-articular fracture of the distal end of the radius. J Bone Joint Surg Am 1996; 78(3): 357-65. Mayfield JK. Mechanism of carpal injuries. Clin Orthop Relat Res 1980; (149): 45-54. Weiss AP, Akelman E, Lambiase R. Comparison of the findings of triple-injection cinearthrography of the wrist with those of arthroscopy. J Bone Joint Surg Am 1996; 78(3): 348-56. Espinosa-Gutiérrez A, Rivas-Montero JA, Elías-Escobedo A, Alisedo-Ochoa PG. Artroscopía de muñieca en fracturas del extremo distal del radio. Acta Ortop Mex 2009; 23(6): 358-65. Hattori Y, Doi K, Estrella EP, Chen G. Arthroscopically assisted reduction with volar plating or external fixation for displaced intra-articular fractures of the distal radius in the elderly patients. Hand Surg 2007; 12(1): 1-12. Hardy P, Gomes N, Chebil M, Bauer T. Wrist arthroscopy and intra-articular fractures of the distal radius in young adults. Knee Surg Sports Traumatol Arthrosc 2006; 14(11): 1225-30. Peicha G, Seibert FJ, Fellinger M, Grechenig W, Schippinger G. Lesions of the scapholunate ligaments in acute wrist trauma--arthroscopic diagnosis and minimally invasive treatment. Knee Surg Sports Traumatol Arthrosc 1997; 5(3): 176-83. Laulan J, Bismuth JP. Intracarpal ligamentous lesions associated with fractures of the distal radius: Outcome at one year. A prospective study of 95 cases. Acta Orthop Belg 1999; 65(4): 418-23. Picha BM, Konstantakos EK, Gordon DA. Incidence of bilateral scapholunate dissociation in symptomatic and asymptomatic wrists. J Hand Surg Am 2012; 37(6): 1130-5. Yoshida S, Yoshida K, Sakai K, Nakama K, Shiba N. Frequency of Scapholunate Ligament Injuries Associated with Distal Radius Shearing Fracture: Correlation of Fracture Patterns and Ligament Tear. Hand Surg 2015; 20(3): 440-6. Finsen V, Rajabi B, Rod O, Roed K, Alm-Paulsen PS, Russwurm H. The clinical outcome after extra-articular colles fractures with simultaneous moderate scapholunate dissociation. J Wrist Surg 2014; 3(2): 123-7. Gradl G, Pillukat T, Fuchsberger T, Knobe M, Ring D, Prommersberger KJ. The functional outcome of acute scapholunate ligament repair in patients with intraarticular distal radius fractures treated by internal fixation. Arch Orthop Trauma Surg 2013; 133(9): 1281-7.